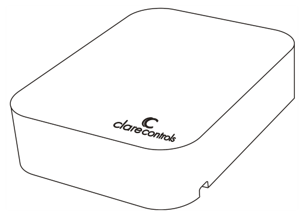 The Clare Controls CLIQ.mini controller provides all device management services, supports all Clare user interface services, and acts as the gateway to the ClareCloud for system updates. The controller comes complete with the ClareOS preloaded. The controller also comes equipped with Z-Wave Plus™ for controlling your Z-Wave devices, such as integrated lighting, thermostats, sensors, and door locks. Note: Models are subject to change without notice. WARNING: Any changes or modifications made to this product not expressly authorized by the manufacturer could void the user’s right to operate this device. Remove all contents from the CLIQ.mini packaging and ensure you have the following items. WARNING: Do not apply power to the CLIQ.mini until installation is complete. Failure to do so may result in bodily injury and/or damage to the equipment. We recommend placing the CLIQ.mini in an open centrally located area within the home, and using the included wall mount to attach the CLIQ.mini to a standard single gang box. The CLIQ.mini should not be mounted in a structured enclosure, panel, or closet. If the CLIQ.mini is placed in a closed off area, the wireless signal strength may be compromised. Note: To prevent radio frequency (RF) interference, we recommend that you place the CLIQ.mini away from devices that may cause interference and away from grounded metals. After installing the CLIQ.mini and downloading the ClareHome App, power on the CLIQ.mini. The CLIQ.mini can be powered using PoE or the included 5v micro USB adapter. WARNING: You must follow the instructions below to power your CLIQ.mini. Failure to do so may result in bodily injury and/or damage to the equipment. Note: PoE connection can be provided through a PoE switch or PoE injector. 1. Verify the PoE switch is connected to the Internet. 2. Connect the Ethernet cable from the PoE enabled switch to the Ethernet port on the CLIQ.mini. See Figure 1, item 6. 3. Once the mini has internet connection, the mini may update. Once the mini begins to update, the LED flashes blue and red in unison. This update can take up to five minutes. Note: Do not remove power or network connection during this process, doing so may cause damage to the ClareHome system requiring maintenance from Technical Services. Note: This requires two Ethernet cables, they are referred to as cable #1 and cable#2. 1. Plug an Ethernet cable (#1) into the Ethernet port on your CLIQ.mini. See Figure 2, item 1.1. 2. Plug the opposite end of the cable into the PoE injector port labeled POE. See, Figure 2, item 1.2. 3. 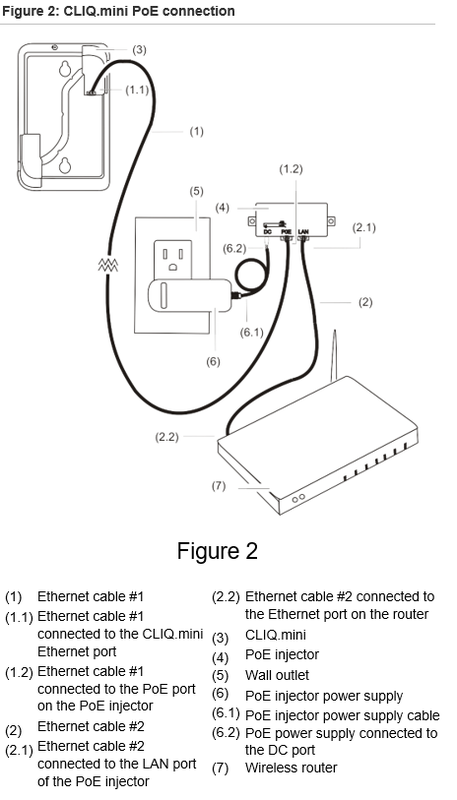 Plug a separate Ethernet cable (#2) into the LAN port on the PoE injector. See, Figure 2, item 2.1. 4. Plug the opposite end of the Ethernet cable (#2) into an Ethernet port on your router. See Figure 2, item 2.2. 5. Plug the PoE power supply into the D/C port on the PoE injector. See Figure 2, item 6.2. 6. Plug the PoE power supply into a wall outlet. See Figure 2, items 6 and 5. 7. Once the mini has internet connection, the mini may update. Once the mini begins to update, the LED flashes blue and red in unison. This update can take up to five minutes. 1. 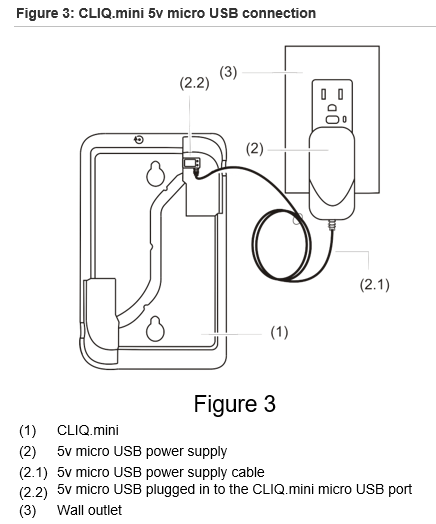 Plug the micro USB end of the power adapter into the micro USB port on the upper-right rear corner of the CLIQ.mini See Figure 3, item 2.2. 2. Connect the power supply’s plug end into a wall outlet. See Figure 3, items 2 and 3. 3. Check the LED on the top edge of the CLIQ.mini. It flashes red until Wi-Fi is configured. See Figure 6, item 1. This setup requires a Local Area Network (LAN). LAN connection requires an Ethernet cable. 1. Plug an Ethernet cable into the Ethernet port on your CLIQ.mini. See Figure 2, item 1.1. 2. Run the Ethernet cable through the wire routing channel, and then Plug the opposite end of the cable into the Ethernet port on the router. See Figure 1, item 3. 3. Plug the micro USB end of the power adapter into the micro USB port on the upper-right rear corner of the CLIQ.mini See Figure 3, item 2.2. 4. Connect the power supply’s plug end into a wall outlet. See Figure 3, items 2 and 3. 5. Once the mini has internet connection, the mini may update. Once the mini begins to update, the LED flashes blue and red in unison. This update can take up to five minutes. After the CLIQ.mini’s installation, setup the connection. There are two different setup options, PoE (Power over Ethernet) and Wi-Fi connection. Follow the steps according to how the CLIQ.mini is powered. 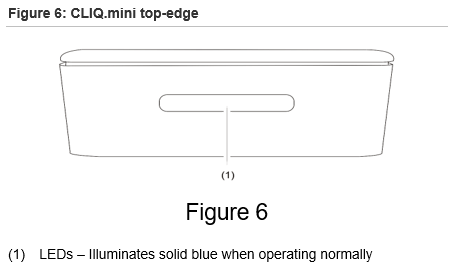 If the CLIQ.mini’s LED is not solid blue after 90 seconds, see “Troubleshooting steps”. Your Android or iOS device must be connected to your home network. 1. Download and open the ClareHome App. 2. Tap the Inventory icon, and then tap the Settings icon. 3. The Locations dialog displays. Select the displayed project. Note: The project displays as - -No project- - (ClareHome). See Figure 4. 4. Enter the PIN 1234 as prompted. 5. Tap outside of the Locations dialog box. You are now ready to configure the project from Fusion. 1. Download the ClareHome App. 2. Ensure that the CLIQ.mini is powered on, and then connect your Android or iOS device to the Clare Wi-Fi (Clare Wi-Fi XXXX). Note: XXXX represents the last characters 4 of the unit’s MAC address. 3. Open the ClareHome App, and then wait for network dialog to display. 4. Enter your home’s Wi-Fi SSID and password as prompted, and then tap Next. Note: The SSID and password are case sensitive. 5. Follow the displayed instructions. 6. Wait for the LED to become solid blue, this can take up to 90 seconds. If the LED does not change solid blue, see “Troubleshooting steps”. Once the mini has internet connection, the mini may update. Once the mini begins to update, the LED flashes blue and red in unison. This update can take up to five minutes. Do not remove power or network connection during this process, doing so may cause damage to the ClareHome system requiring maintenance from Technical Services. 7. Reconnect your Android or iOS device to your home’s Wi-Fi, and then re-open the ClareHome App. 8. Tap the Inventory icon , and then tap the Settings icon. 9. The Locations dialog displays. Select the project -- No project -- (ClareHome). See Figure 4. 10. Tap outside of the Locations dialog box, and then enter the PIN 1234 as prompted. Refer to the Fusion Configuration Tool Administrator Guide (Doc ID 069) for instructions on creating, testing, and deploying a project. When you deploy the project from Fusion, it will deploy to the CLIQ.mini. When mounting the CLIQ.mini to the desired gang box, we recommend using the provided wall mounting bracket. 1. Place the wall mount against a standard gang box. See Figure 5, items 1 and 3. 2. Align the long screws in the wall mount, and then fully screw them in. Repeat this with the short screws, stopping with enough room remaining to support the CLIQ.mini. See Figure 5, items 4 and 5. 3. Align the CLIQ.mini over the screws, and then slide it down, locking it in place. 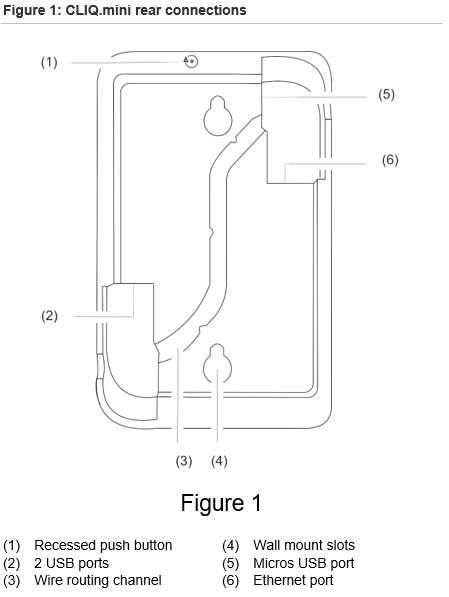 See Figure 5, item 6. The CLIQ.mini has LED indicators that change colors based on the CLIQ.mini’s status. Once powered on, observe the CLIQ.mini’s LED status. Figure 6 identifies the LEDs on the CLIQ.mini. 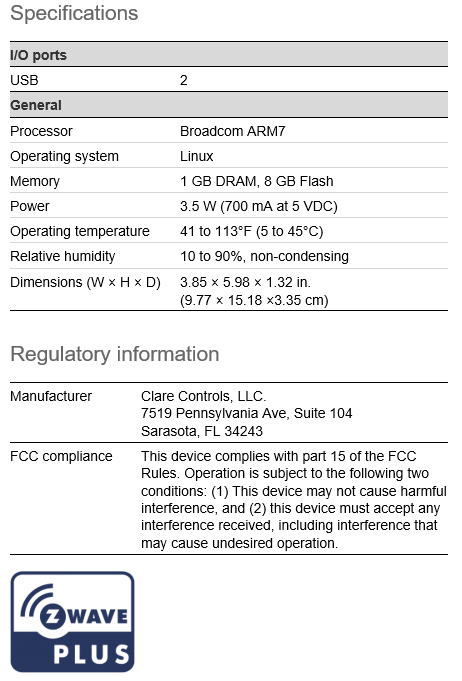 Note: The ClareHome connection can take up to 90 seconds. Wait the full 90 seconds before attempting to troubleshoot. When the LED flashes blue in 1 second intervals, the device is booting normally. When the device is solid blue after booting up, the device is functioning properly. When the LED flashes blue in .5 seconds intervals, the CLIQ is unable to connect to the internet. Alternating: When the LED flashes red and blue in .5 second intervals, the CLIQ.mini is restarting in Access Point (AP) mode. Flashing in unison at .5 second intervals: The CLIQ.mini is updating. When the LED flashes red in .5 second intervals, the CLIQ.mini is in AP mode. Note: When the controller is in AP mode, it creates its own wireless network. When the LED is red or not lit, see the “Troubleshooting steps”. 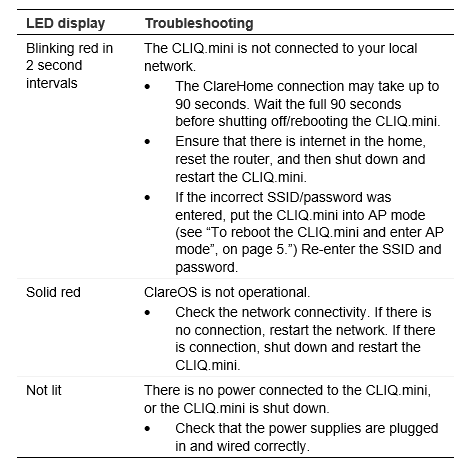 When the CLIQ.mini is not functioning properly, use the LED table and troubleshooting steps below. 1. Locate the recessed push button on the CLIQ.mini. See Figure 1, item 1. 2. Insert the paper clip (provided) pressing the button down and holding for 5 seconds. 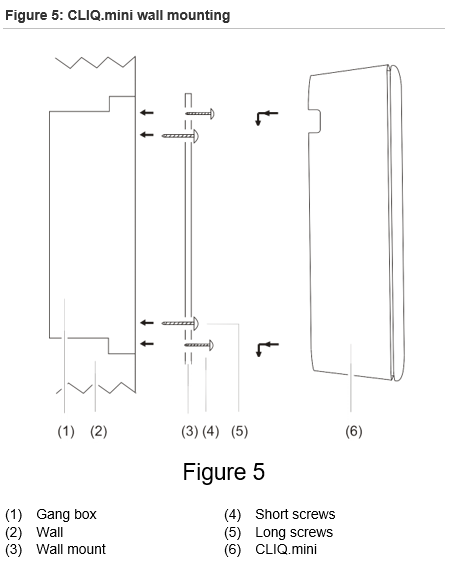 See Figure 7. 3. Remove the paper clip and observe the LED behavior. The CLIQ.mini’s LED indicators alternate red and blue signifying it has started shutting down. 4. After the CLIQ.mini shuts down, disconnect the CLIQ.mini’s power supply. 5. Reconnect the power supply and verify that the CLIQ.mini restarts. Continue with installation and setup. 2. Insert the paper clip (provided) pressing the button down and holding for 20 seconds. See Figure 7. 3. Remove the paper clip and observe the LED behavior. The CLIQ.mini’s LED indicators alternate red and blue signifying it has entered the reboot state. 4. Once the CLIQ.mini boots and the LED flashes red in .5 second intervals, it is in AP mode. Continue with installation and setup. 2. Connect the Ethernet cable to the Ethernet port on the CLQ.mini. See Figure 1, item 6. 3. Locate the recessed push button on the CLIQ.mini. See Figure 1, item 1. 4. Insert the paper clip (provided) pressing the button down and holding for 5 seconds. See Figure 7. 5. Remove the paper clip and observe the LED behavior. The CLIQ.mini’s LED indicators alternate red and blue signifying it has started shutting down. 6. After the CLIQ.mini shuts down, disconnect the CLIQ.mini’s power supply. 7. Reconnect the power supply and verify that the CLIQ.mini restarts. Continue with installation and setup. Ensure that the home has internet connection. If the SSID menu closes before it has successfully connected, you must shut down and restart the CLIQ.mini. If the problem persists after following the troubleshooting steps, please contact tech support.